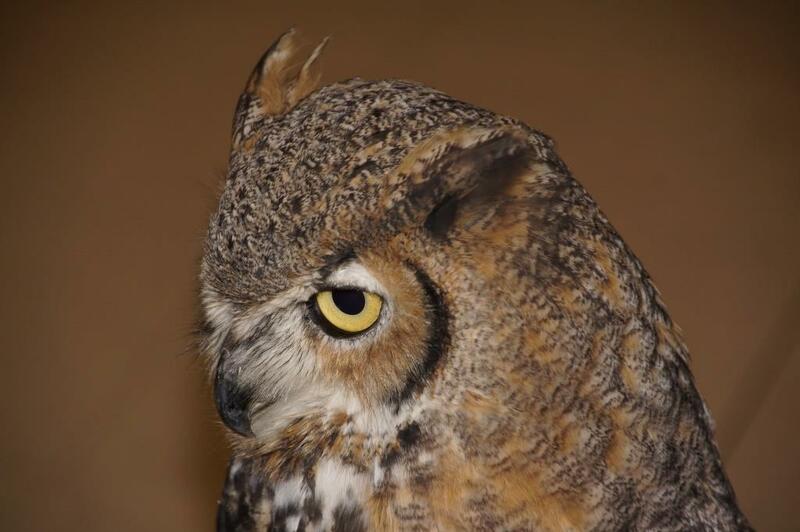 Lois is one of The Raptor Center’s imprinted great horned owls. At the end of April 2001, a young owl was found and could not be replaced in its nest. After a month, she was brought to the Raptor Center and admitted as a possible imprint. After being evaluated by the veterinarians at The Raptor Center, it was determined that she had been imprinted, and thus could not be released back into the wild. After being evaluated for several weeks, she was placed into The Raptor Center’s education department. An imprinted raptor cannot be returned to the wild because it has lost its natural fear of humans. Great horned owls demonstrate this imprinting by soliciting food from humans and by showing fear of other great horned owls. Imprinting occurs during the critical learning period of brain development. This permanent injury creates a situation in which an individual of a species sees someone of another species as its own kind.